Color footage related to WWII from 1939 to 1945. WII-era British Bombers in Flight Air to air TLS of WWII British Royal Air Force twin engine bomber-- apparently a Bristol Neaufighter-- in flight. Out of focus air to air shot of an Avro 683 Lancaster bomber in flight. Slightly out of focus air to air shot of a Handley Page H.P. 57 Halifax bomber in flight. WWII-era B-17 Bomber in Flight Low angle air to air TLS of a WWII era United States Air Force Boeing B-17 Flying Fortress in flight. War Damage in Bavaria, 1945 : Silent, unedited, color footage of war damaged areas in Bavaria in southern Germany. GVs several men working to clear the rubble of their wartorn, bomed-out villiage, most of the men in FG are shoveling debris, industrial factory smokestacks in BG. MLS crucifix statue on hillside, beautiful patoral scene of rolling hills in the BG. MS building facade, with large lettering "Schweinfurt Hbf" (train station / rail), roof showing bomb damage. Elevated LS area bombed with buildings destroyed, reduced to rubble. Low angle GV bombed-out building facade, top half of building is missing. Street level TLS showing destroyed town, buildings reduced to massive rubble piles. TLS twisted remains of the Wurzburg train / rail station surrounded by rubble. LS remains of the destroyed Wurzburg train station, a couple pedestrians seen walking in FG. Aerial over unidentified city. U.S. Troops in Germany, April 1945: Silent, unedited, color film of U.S. military personnel in Germany in April, 1945, shot by U.S. Army film crews. Tracking shots along tree-lined road through German countryside, we pass a young man who looks like he is giving a Nazi salute, then two women walking along carrying a homemade white flag over their heads, next passing a group of German civilian men standing roadside holding a large white flag, a dog with them runs out of way of vehicle. GV German military prisoners including SS officer sitting on ground against a fence. Various shots of horse drawn wagons with contents spilled and lying about a village street, it appears a scuffle has occurred, American soldiers at the scene. GV American GI running through clearing in woods, looks like he is carrying a paper, possibly a courier. GV same clearing as tank fires and a stream of American soldiers run past with guns. LSs German countryside with smoke and trees burning. LS pans of countryside, following bomber flying overhead. Brief night LS of ground fire burning seen through leafless branches of trees. POVs from Plane - Strafing Targets: Silent, unedited, color POVs from allied / American aircraft on low level strafing mission over Germany, spring 1945. Various shots from allied plane as German targets are fired upon: first shots shot machine gun fire hitting water, series of shots showing machine gun fire hitting roads in rural towns, series of shots showing machine gun fire blasting on wooded areas, aerial of bombs dropping on & destroying bridge. Master 1480 - Tape 1 Slightly shaky LS ruins of buildings & rubble along war-torn, bombed-out street of fairly populated German town on otherwise beautiful day; red-headed white woman wearing dress & white man in business suit ride bicycles along street (away from camera); pan to ruins of bombed bldg. LS ruins & rubble of bombed-out building. Panning LS building ruins & rubble, people walking or riding bicycles along street; an American GI on a bicycle rides hard toward & by cam; cable car lines overhead. 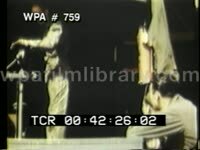 Master 1490 - Tape 1 Color WWII (World War Two, WW II, World War II) footage. Brief but great shot from gunner turret of B-17 Flying Fortress bomber in flight: idle heavy machine gun in FG, bomber fleet flying in formation in BG. MS ammunition bandolier hanging in gunner turret, bombers flying in distance. Air to air shot of bombers in flight. Great air to air shot of three B-17 Flying Fortress bombers in flight. 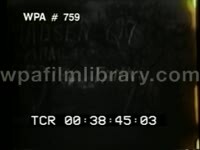 Master 1494 - Tape 1 COLOR World War II footage. Excellent air to air TLS/MSs U.S. B-29 Superfortress bomber in flight over mountain range; machine gun top turret nearest cabin swivels, fires in several directions. Great air to air MSs remote control bottom turrets along belly of B-29 in flight; nice shot of belly turret firing machine gun, spent shells falling. Great air to air shot tail turret machine guns firing (tailgunner). Excellent air to air shots several United States B-29 Superfortress bombers in flight, dropping numerous bombs. Air to air shots of several B-29 bombers in flight (some shots they fly in tight formation). Nice low angle LS seven B-29 bombers flying over camera. More air to air shots of B-29s in flight. Great high angle air to air shot of several B-29 bombers flying over U.S. navy ship fleet out to sea. Master 1497 - Tape 1 Excellent extreme high angle aerial shots of dumb bombs falling from belly of U.S. B-29 bomber in flight, exploding in densely forested area in Asia. Rear view MSs bombardier viewing through scope at turret, waving. Air to air shots B-29 Superfortress bombers in flight, dropping large amounts of bombs. Great high angle aerial shots bombs falling, disappearing however briefly among the clouds. More air to air shots B-29 bombers dropping bombs. Excellent high angle aerial shots numerous dumb bombs falling through sky, hurtling toward serene blue ocean below; second shot eventually reveals coastline, bombs falling & exploding on coastal town. Nice high angle aerial shots of anti-aircraft artillery fire exploding near plane (cam) flying over smoky town. Aerial shot of explosions on developed area (bombing). Air to air shots large plumes of smoke. Air to air shots of B-29 Superfortress bomber in flight over mountains -- note the turning top-mounted gun turret near the cockpit. Air to air shots of gun turrets below fuselage. Master 1821 - Tape 2 Excellent extreme high angle air to air shots of squadron of U.S.A.A.F. B-17 Flying Fortress bomber planes in flight over head cloud cover. Low angle air to air shots of U.S. B-17 squadron in flight. High angle air to air shots of squadron of U.S.A.A.F. B-24 Liberator bomber planes in flight over heavy cloud cover. Great subjective POV aerial shot over bombed-out town in Europe (war damage, bombardment, aftermath). Air to air shots of B-17 Flying Fortress bomber planes in flight. WWII Planes Crash - Various shots of actual military plane crashes circa World War Two. A fighter plane crashes into the sea, an American naval destroyer in BG. Dirty, scratchy. Flames rise from a fighter plane that has crashed into the ocean. A pilot parachutes to safety. Air to air shot of what appears to be an early twin engine USAF Martin B-26 Marauder bomber in flight. Air to air shots of unidentified USAF jet bombers in flight. 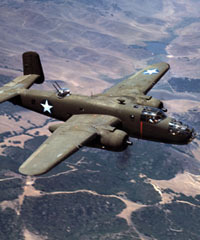 Air to air shot of USAF B-26 Marauder in flight. Air to air shot of several Douglas A-24 Banshee attack dive bombers in flight. Air to air shot of a USAF B-17 Flying Fortress bomber plane in flight. Air to air shots of several USAF Consolidated B-24 Liberator bomber planes in flight. Low angle shot of several Boeing B-29 Superfortress bomber planes in flight. World War II bombers in Flight Air to air shot of Boeing B-29 Superfortress in flight. Air to air shot of a B-17 Flying Fortress in flight. Air to air shots of several B-29 Superfortresses in flight. MS building exterior reading "Potsdamer Bahnhof" (rail station, train station). WS exterior of the bombed out Potsdamer Bahnhof building, pedestrians seen moving about the street in FG. LS exterior of the bombed out & smoke stained buildings. TLS looking down center of street, massive pile of twisted rubble blocks access. Static TLS looking straight ahead at unidentifiable twisted rubble laying on the ground, stretching across the entire frame, reaching onto steps of bombed out building facade of the Potsdamer Bahnhof station. TLS looking down street, bombed-out buildings & rubble piles line the way. GV illegible (due to sun washout) sign in front of building. Low angle MS looking up at sign post reading "stra enbahn-haltestelle" (tram stop), top of bomb damaged building seen in BG. TLS massive damage done to Berlin, unidentifiable flattened rubble in FG, bombed out gothic style building in BG (cathedral?). TLS same location from different angle, poles have been knocked down. TLS same location from yet a third angle, this time showing pedestrians using downed column as a make-shift bridge to cross rubble pile, one man carries bicycle across. TLS destroyed cathedral with rubble blanketing the FG. GV bombed out building. GV woman seated on fence ledge of bombed out building, she is sewing on the street w/ rubble behind her, pan to show the street lined w/bombed out buildings. Low ange MS looking up at street sign reading "Graf-Spee-Strasse". MS street signs at the intersection of "Graf-Spee-Strasse" & "Tirpitzufer". MS damaged street sign w/bombed out building in BG. MS pedestrians walking past wall of rubble. Low angle MS facade of bombed building. TLS eerily vacant street lined w/bombed buildings. Low angle GV bombed out building missing roof. CU man holding slate reading "Clothier - July 9th 1945 - Berlin". MCU man in aviation leather jacket talking to elderly man on the street. MCU man holding slate next to "Air Force Photo" Jeep. GV men & women walking out of building in drab, dark colored clothing, most likely a public transportation station (train, tram, subway). GV as men & women emerge from subway station, climbing stairs of the underground. GV crowd of people filing out of bombed out shell of U-Bahn subway station, it's July yet people are wearing everything from short sleeves to winter coats. GV station w/a handful of commuters in the bombed out lobby, good look at the once elaborate station reduced to a skeletal frame. Rear MSs men & women walking out of station through wrought iron gates. WS city in ruins, pedestrians walk & ride bicycles past backdrop of bombed out, roofless buildings, entire city block has been destroyed. GV pan up facade of windowless building (tower) w/ clock. Low angle MSs decorative tower facade w/ clock. CU slate reading "Clothier - July 12 1945- Berlin". GVs unidentified white rectangular shaped building with squared columns w/ rubble around it, typical totalitarian / Nazi style of architecture. German Town: TLS road showing jeep & tank w/ American GIs, the tank pulls away fading into dust cloud. GV 2 tanks w/ several GIs sitting on top, parked in front of traditional half-timbered buildings. WS of German military prisoners who have been sitting at side of road standing & picking up their packs as they are about to move out. Profile MS of Sherman tank parked in the sun with American GI sitting on top and another looking out of turret. WS of Sherman tank & crew as it fires. LS German countryside w/ rural buildings on a hill, there is an explosion of smoke from either tank or plane fire. Ground to air shots of plane flying over German village, American GIs are seen in FG. Allied Airfield: GV German airplane on airfield (maybe Fi 156). Various shots of allied airfield w/ planes taxiing & taking off. MCU/MS mechanic grinding metal on wheel. American Base Camp: MCU American GI hanging laundry on clothesline to dry. MSs Gis washing clothes in a metal drum full of water heated by fire below. MS GIs taking dried clothes down from line, folding clothes. MS GI seated, reading letter (mail). MS GI brushing out interior of military vehicle. MS American GI lighting fire under barrel. MCU same GI eating a cracker, smiling for camera. MCUs men at camp using wrench. MCU men conversing. MS/MCU American GIs washing military trucks, scrubbing tires w/ brushes.